1. Get Online! 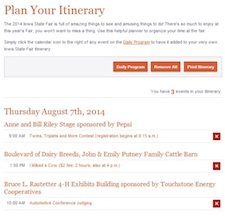 If you’re not sure which days to attend the Fair, we recommend checking out our online Daily Program. It lists every event that happens every day and can give you a good look at programming that might interest you. Once you find events that you can’t miss, you can save them on our printable itinerary builder. Make sure to save time for food! This year’s Fair features several new foods including five finalists in our new value-priced foods contest that are $3. Plus, check out the nearly 70 foods-on-a-stick offered all around the Fairgrounds. Afraid you’re going to miss something at the Fair? Don’t worry. We offer pre-made, self-guided walking tours. The walking tours are available from three different gates in full-day, half-day and quick options. Be sure to check out our FAQs for some of the more common questions asked by our Fairgoers. 2. 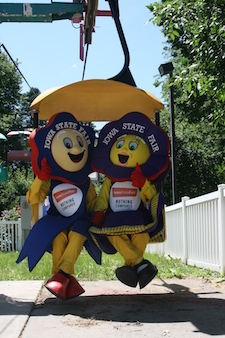 Catch a Deal: The next step to your Fair adventure is tickets! Advance admission is available on our website. Now through August 6, while supplies last, adult tickets are $8, children, ages 6-11, are $5 and children 5 and under are free. You can also purchase Fair Play Packs which offer discounts on admission, food and attractions. 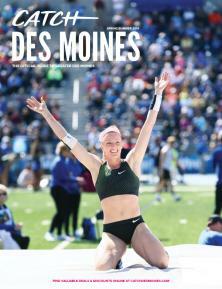 Advance admission tickets and Play Packs are also available at participating Hy-Vee and Hy-Vee Drug Stores, Dahl’s Food and Fareway stores as well as on the porch of the Administration Building at the Fairgrounds. 3. Stay the Night! Depending on your travel time, you may want to consider local hotels to rest your feet and get a good night’s sleep. catchdesmoines.com has a great list of hotels around the Fairgrounds. Tent camping is also available right on the Fairgrounds for those who are more adventurous. 4. 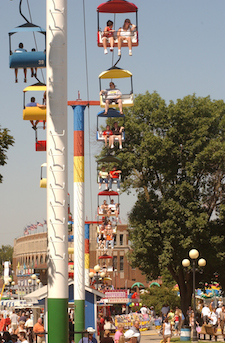 Get Here Fast: The Fairgrounds are located at East 30th and East University Avenue, just 10 minutes east of Downtown Des Moines. Parking is available on the grounds for $10 per vehicle, but space is limited. There are three DART Park and Ride locations at 7th and Center Street, Southeast Polk School and the State Capitol. Parking is free at the locations and the fare is $2 for adults and $1 for seniors (ages 65+) and children (ages 6-11). Show your advance admission ticket and receive half-off bus fare! 5. Pack Your Bags: Before you leave home for your day at the Fair, remember to bring a few things to make your day run smoothly. First, wear comfortable shoes. Our large Fairgrounds can seem even more daunting with sore feet or blisters. Second, wear and bring sunscreen. August in Iowa is hot. The sun will be shining, and it won’t take long before your skin gets hot, too. Remember to stay hydrated and take a break at the Fair. There are plenty of air-conditioned buildings and indoor activities.